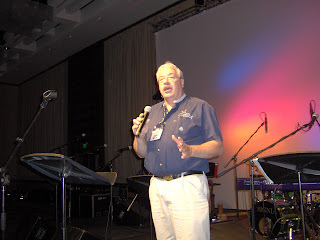 After 11 years as pastor of the Millersburg, Ohio, Grace Brethren Church, Roland Maust (shown here singing at Celebrate06 national conference) is concluding his ministry at Millersburg and will become the pastor of the Grace Brethren church in Uniontown, Pennsylvania. Pastor Maust said, “Our eleven years at Millersburg have been a time of growth and deepening in our lives, and I pray in the church as well. As we leave, we pray all of God’s choicest blessings on our family and friends here at Millersburg.